I was so happy to see Sabrina (Cook22) as the Featured Stamper over at Split Coast this week!! As soon as I saw her Winter Bird in the Woods card I knew I wanted to CASE it. 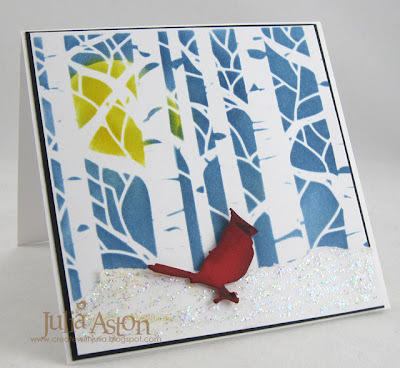 I have the same Aspen Trees template from The Crafter's Workshop and I loved how she used it on her card. Things I changed - I sponged my trees on white cardstock instead of patterned paper - I used a different bird (the cardinal is my favorite!) 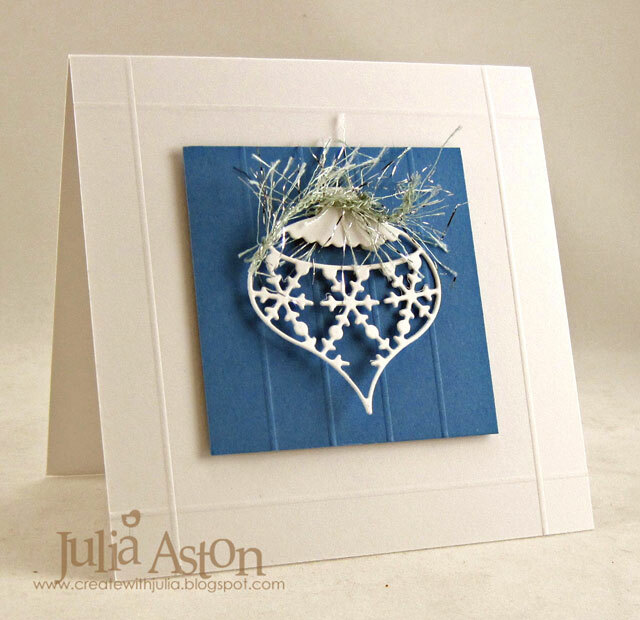 and made the snowy ground with a torn piece of white card stock covered with Crystal Ice Stickles instead of paint. I had a little trouble masking and sponging my moon behind the trees with the template despite 3 tries! - it's not quite a perfect circle (!?!) and my colors kept mixing when I was sponging the different areas. I'll have to keep working on thatA! My card is 4 1/4" x 4 1/4"
The cardinal is a mini die from Tim Holtz - I colored the black bit on his face and feet with a marker and I sponged all the edges with Ranger Distress Brushed Corduroy. He's popped up on the snow with foam tape. 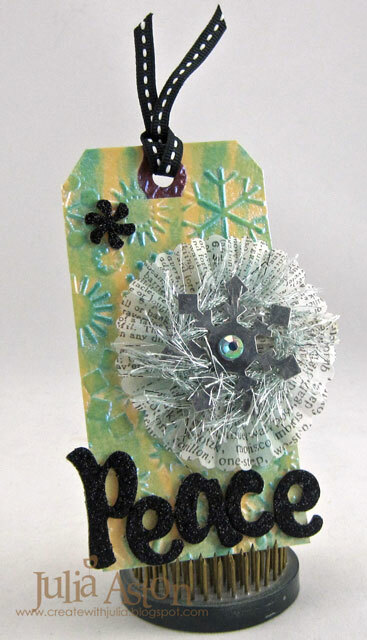 Wishing all my stamping and blogging friends a Happy, healthy and very crafty 2013! Please stay safe tonight everyone! Wow - I can't believe I haven't posted all week! I've been home on vacation - and stamping - but not posting here - so - I have a few things to share as the good old year of 2012 comes to a close! 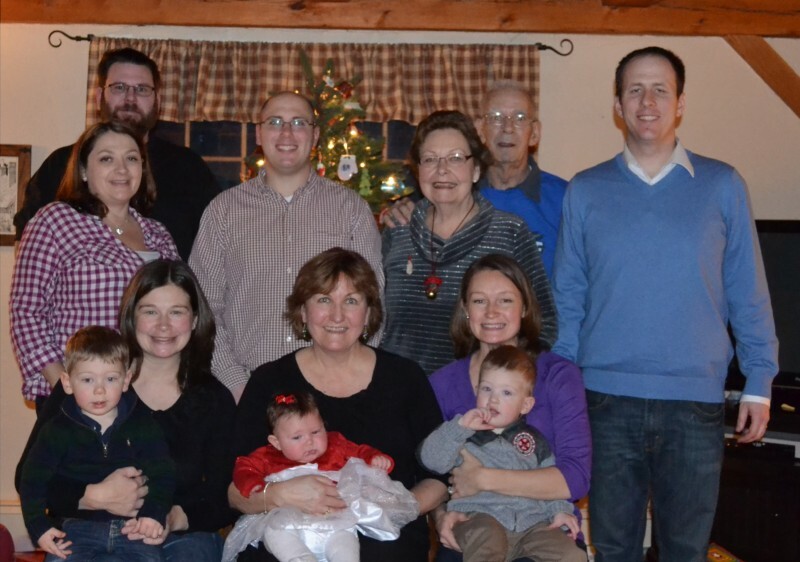 First I have a Christmas Day family picture to share - unfortunately DH Kent had to work (!) - so he is missing from the pic. I did bring him home a Christmas dinner and we opened our gifts Christmas night. My first card to share was made for the Split Coast Inspiration Challenge - inspired by this white, gold and black East Six invitation from the Wedding Bells web site. I've been needing Anniversary Cards for my stash - so that is what I made for my card. 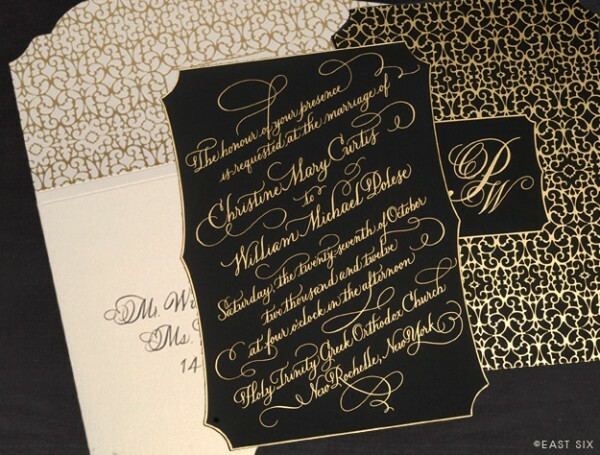 I gold embossed everything on this card! The camellia flower, the sentiment and the lovely background. I die cut the sentiment with Labels 25 Nestabilities and popped it up on the card with foam tape. I added a little red heart gem for just a touch of color! 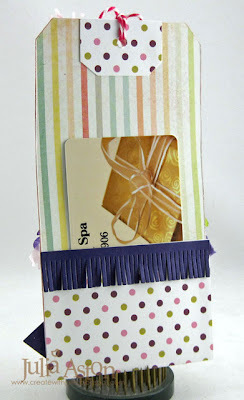 I made this second card for the Ways To Use It challenge on Split Coast - to show what your 2012 Resolution had been - mine was to USE MY STUFF!! 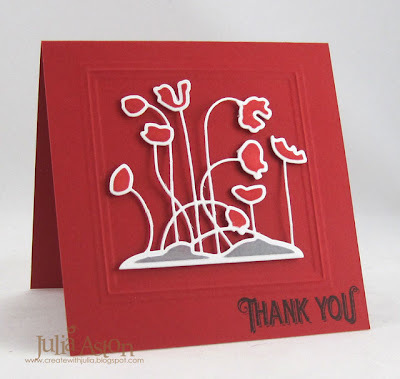 I used this Poppy Patch Spellbinders die that I purchased some time ago and hadn't used yet! After I die cut the poppy patch - I sponged the poppies with Ranger Distress Festive Berries and the ground with Iced Spruce before removing the die. I embossed a Nestability square on the front of the card and layered the poppy patch inside the frame with foam tape. Then I just stamped the Thank You in the corner. So - what are your plans for New Year's Eve??? Kent and I are both working on Monday - so we are going out to eat early when we get home around 6 - then sitting on the sofa and watching the festivities on TV - locally Boston has a great events going on and then fire works (we used to go in to it but it can get really cold being out there!) and of course, NYC has the traditional falling ball at midnight! Stamps: Waltzingmouse - Vintage Christmas Backgrounder, Camelia, Happy Anniversary from Cameo to Go. Accessories: Poppy Patch die - Spellbinders, square Nestabilities, foam tape. 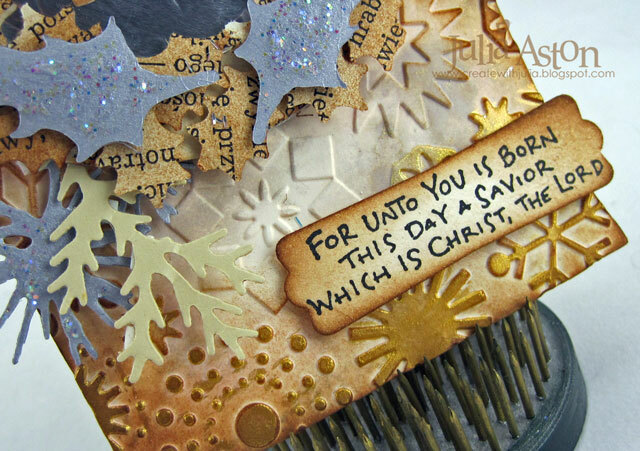 Wishing all my fellow stampers and bloggers a most Blessed Christmas Eve as Christians around the world begin to celebrate the birth of our savior, Jesus Christ. I have a few things to share with you for Christmas. First is this wonderful picture of my 1 1/2 year old grandnephew, James - fast asleep on Santa's lap. They were on vacation in FL at Disneyworld. After a busy day at the park they got in line to visit Santa - and James just couldn't say awake any longer - so his parents just put him in Santa's lap sound asleep - isn't this just precious?! And here are some holiday card/projects I've recently made. I'll just post the pictures with a brief description and list the supplies at the end. I made these tags at the request of my friend Elizabeth. Santa is bringing her 7 year old twins, Paige and Gwen, scrapbooking boxes and he needed some tags to put on the handles so they would know which box belonged to who. 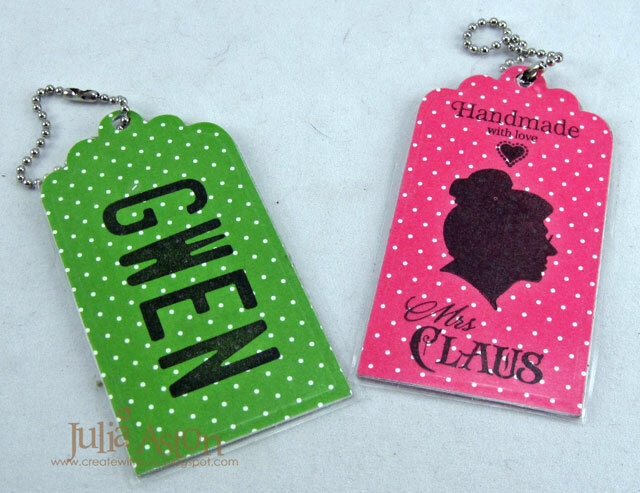 So "Mrs Claus" made these tags for them. Stamps used: letters from Vanity License Plate MFT, handmade with love from Make Your Mark WMS, Mrs Claus and silhouette from Candy Jar Christmas WMS. 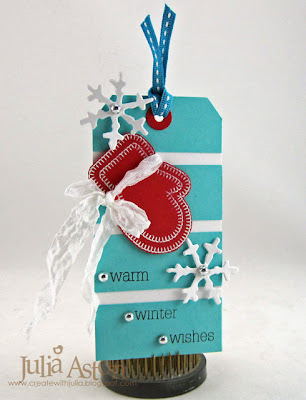 I made this blue tag for last weeks Split Coast Free 4 All challenge to make a one layer tag. I simply stamped the image from Seasonal Remedies, die cut it, sponged the edges before removing the die punched a hole at the top and added the wrinkled seam tape. 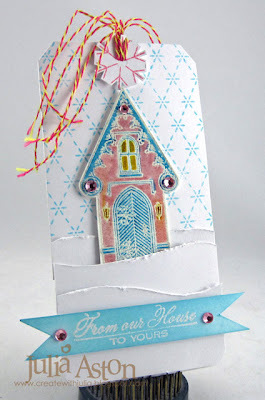 Here's another card I made for this weeks Split Coast Featured Stamper challenge. I.picked out Sylvia's wonderful CAS Enjoy This Day card to CASE. It's also for the Inchie on a Twinchie Technique challenge. 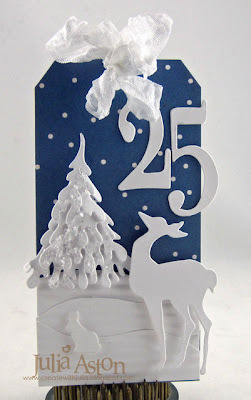 I stamped my 2" 'Twinchie' with a lovely Vintage Christmas Backgrounder stamp from Waltzingmouse and used the Memory Box Country Landscape die. I'm entering my simple Christmas tag in the Cas-ual Friday's Dashing Thru the Holidays Challenge - to make a card within 10 minutes and also the 10 minute Craft Dash challenge - - I think this took me all of 5 minutes to create! And finally - a simple winter Thank You card combining 4 of last weeks Split Coast Challenges.The CAS challenge was a photo inspiration of a potted candle with greenery, the Ways to Use It challenge was Glitz and Glitter, the Free 4 All challenge was a Simple Thanks - and for the Inspiration Challenge I was inspired by some blue shoes. We will certainly all need Thank You cards with all the gift giving and party hosting going on this month and this one whips up quickly! 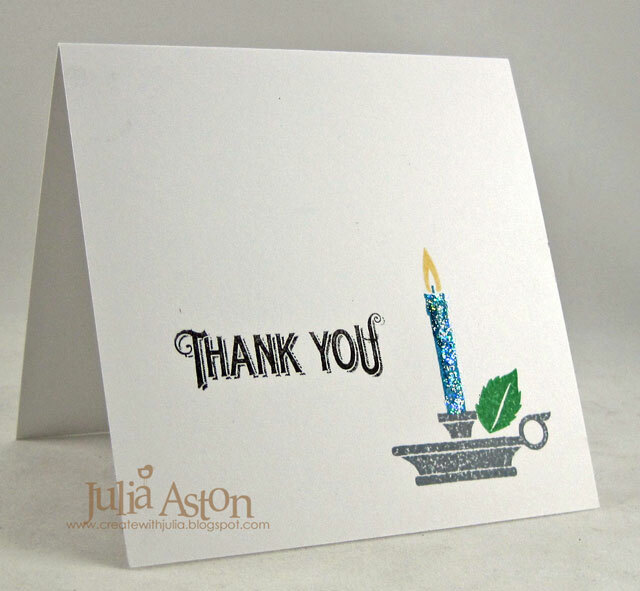 The candle stamp is from Bright Season and the Thank You is from Vintage Garden Seed Packet - both by Waltzingmouse. 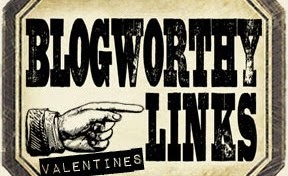 I'd like to take a moment to thank you all for stopping by my blog and leaving me your lovely comments over the past year. 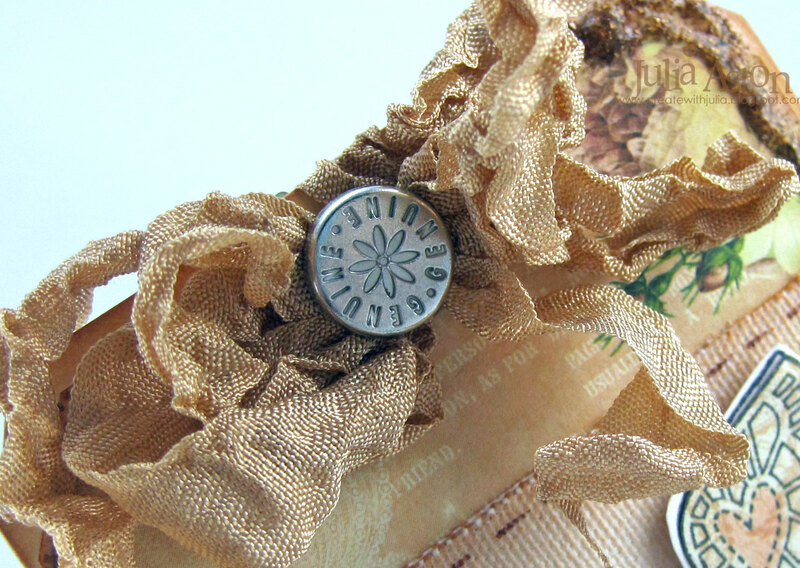 I am so grateful for you - my stamping/blogging friends - I love coming to visit you and being inspired as well! Wishing you all a most blessed holiday season! Stamps: Letters from Vanity License Plate set My Favorite Things, Handmade with love from Make Your Mark set Waltzingmouse, Mrs. Clause and silhouette from Candy Jar Christmas set Waltzingmouse. Accessories: scallop tag die - Spellbinders (retired I think), cropadile, key chain - Tandy Leather, Xyron 510 laminator. Karen's color challenge this week over on Split Coast was to use only neutrals - white or ivory - well I couldn't decide so I used both! 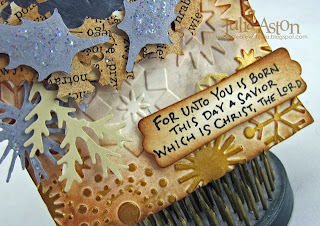 To set off the neutrals I used a lot of texture - the embossed background, the Tim Holtz Alterations wreath die and the wonderful L'll Inker Designs bow die. I bought the bow die SO long ago and never used it (I'm saying that a LOT lately!) and decided now was the time to get it out! and I just love it - what a great bow it makes and it's SO simple! The Thanks is from Waltzingmouse. It's nice to have winter Thank You's on hand! Well - here we are at the end of the weekend (again!) how does the weekend go by so quickly:??!!! I'm trying to use all of the 'stuff' I've been purchasing and then never using (!) 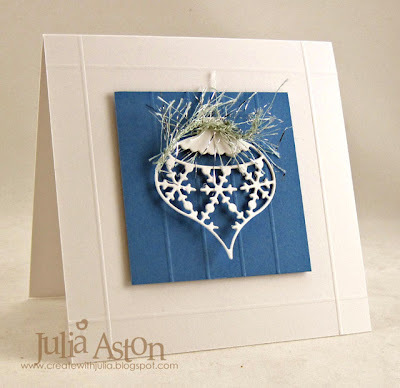 - and Gail used a Memory Box Snowflake ornament die on her card that I have and have not used. I used different colors than Gail, framed my ornament on a panel and used glitter yarn instead of ribbon on my ornament. I did make score lines on my card as Gail did. 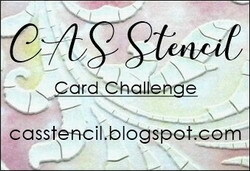 I'm also entering this in this weeks CAS-ual Fridays challenge - To use scoring on your CAS card. I will probably use this as a Thank You card after the holidays - or as a Christmas card for next year! Hi Everyone! happy Saturday - I'm home all day today - getting some Christmas baking time in, a little cleaning up and of course - Stamping! And here is my card. I purchased this pretty reindeer die last year after doing the Tim Holtz 12 tags of Christmas - but then never took it out to use it! 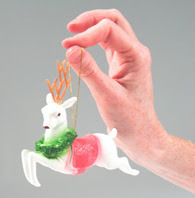 I immediately thought of it when I saw the reindeer ornament for the challenge. 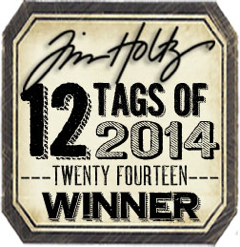 The Joy to the World is also a Tim Holtz Sizzlit die. I wanted to put a wreath around his neck and tried to think if I had a wreath stamp that size I could use - then I thought of using the smallest pinking circle Nestability (which I can't find in any on line store to link to -so maybe they discontinued them??) and punching out the center. It worked perfectly! I cut a slit in the wreath so I could slip it around the neck and taped it on the back. I adhered the deer to the card with foam tape and added the red gems to the wreath and the black tiny twinkle for his eye. And I'd like to offer a prayer to all the families in Newtown, CT where there was a terrible shooting at an elementary school yesterday. 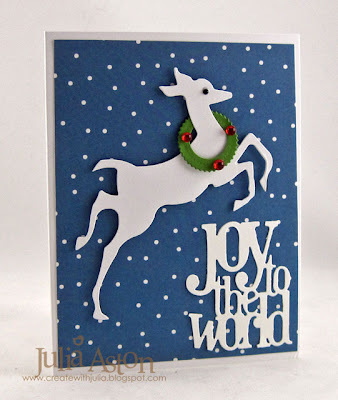 Ellen Hutson's 12 Tags of Christmas - Tag #12!! Whoo hoo!! 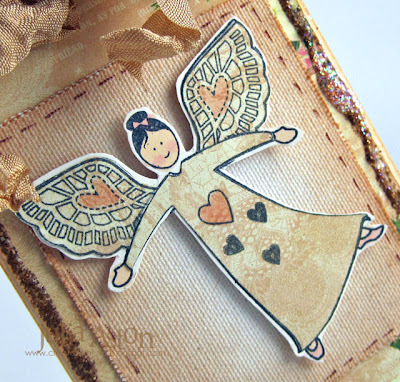 I've finished all 12 of Ellen Hutson's 12 Tags of Christmas with a Feminine Twist! Tag #12 was designed by Ellen Hutson herself. It has 3 cute curvy Christmas trees made out of layered tissue paper and she thought it looked like something from Whooville from the Grinch.by Dr. Seuss. Here's my rendition of her tag: I didn't have the supplies for the technique Ellen used on her tag base, so instead, I clear embossed the tag with Yonder Star Backgrounder by Waltzingmouse. Then I sponged the whole tag with Victorian Velvet Ranger Distress Ink. 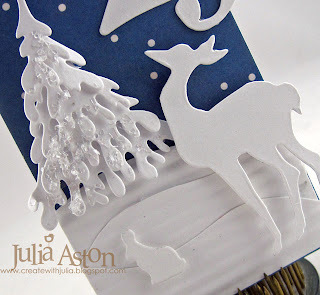 I didn't have the curvy tree die Ellen used so I used my Small Snow Covered Stacker Tree die. 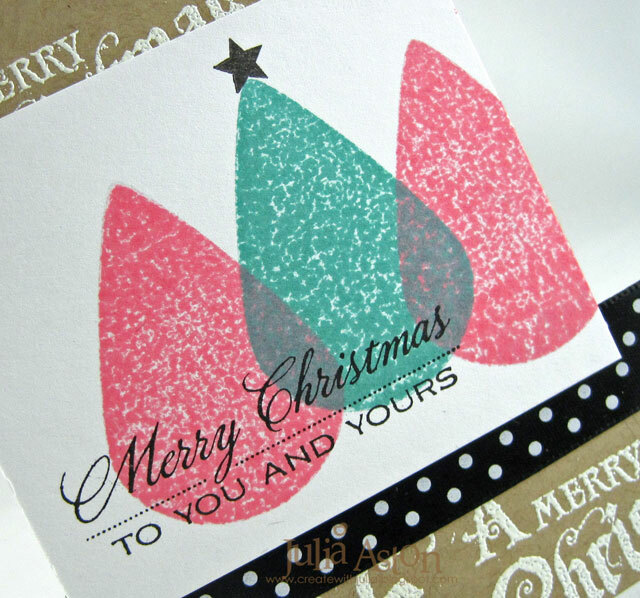 I used 3 colors of tissue paper on each tree - alternating the colors with each die cut layer. I adhered the layers over each other using foam tape. I think my trees look like something out of Whooville too! Very whimsicle with the mixed colors. I made the tassles out of tissue paper using my Fringe Border Die from Memory Box. I added this sentiment from Around Christmastime by WMS punching it with a 2" circle punch. 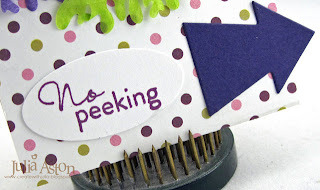 I also added this fun sentiment at the bottom along with a die cut arrow. 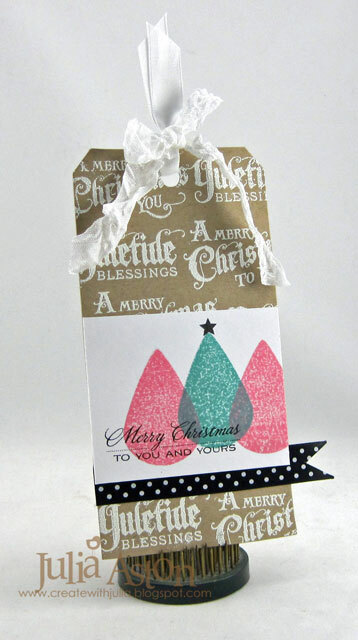 The arrow points to the back of the tag - where the recipient will find....... a gift card tucked inside a little pocket! Wouldn't this be a fun thing to find hanging on the tree Christmas morning!?! 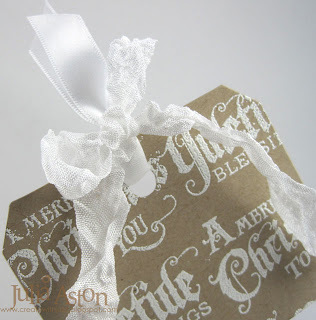 Well - this finishes the 12 Days of Christmas Tags - It was so much fun seeing a new tag each day and then figuring out how to recreate it with the supplies I had in my craft room. I'm so glad I did them this year - and at the same time I'm glad I'm done! Now to move on to other preparations for Christmas - like decorating, baking and wrapping presents!! Paper: White, Royal Violet DP Textstyle Polka Dot Parade - PTI, Stripe DP - Miss Caroline My Mind's Eye Paper Pack, Green, Purple & Pink Tissue paper. Ink: Ranger Distress Victorian Velvet and Seedless Preserves. Accessories: Circle punch - Fiskars, large oval punch - SU, foam tape, ScorTape, Fringe border die - Memory Box, Arrow die - Lead the Way MFT Dienamics, Pink sorbet twine - The Twinery, small snow covered stacker tree die - Dee's Distinctively. 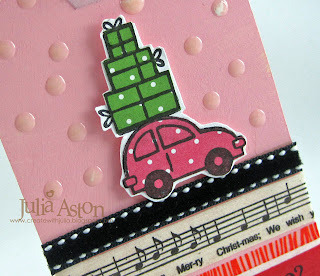 I've got all of Ellen Hutson's 12 Tags of Christmas done accept for yesterday's which will be posted soon! 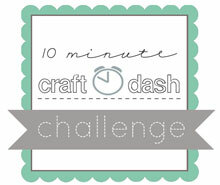 Today I'm posting my versions of Tag #10 and Tag #11. 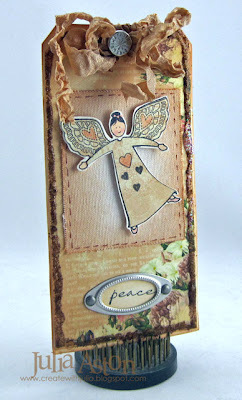 First I cut a tag out of Kraft card stock using Tim Holtz Tag and Bookplate die. I stamped two sentiments from Compliments of the Season by Waltzingmouse repeatedly in rows to cover my tag using Versamark and embossing it in white. I used both satin ribbon and wrinkled seam tape at the top. The trees and star are from Teeny Trees and the sentiment is from A Cottage Christmas - both sets from Waltzingmouse. I used Worn Lipstick and Evergreen Ranger Distress inks for the trees. My angel is from Earth Angel and the peace sentiment is from Festive Foliage. I used a piece of sticky back canvas behind her instead of the cloth that Carolyn used. I drew faux stitching around the edges with a fine tip brown pen and sponged the edges with Ranger Distress Tea Dye Ink. 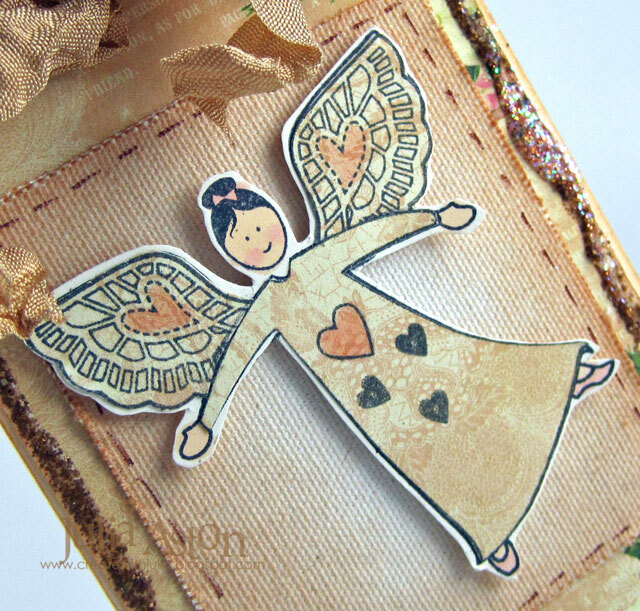 I paper pieced my angel's dress and wings with the same patterned paper I used to cover the tag. I didn't have the Tarnished Silver Glass Glitter Carolyn used so I used Ranger Distress Tea Dye Stickles around the edges of my tag. I tied a triple bow through the hole at the top of the tag using wrinkled seam tape and attached a silver brad from Stampin'Up to the center. 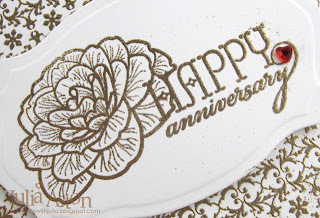 On the bottom I attached an oval metal frame from Stampin'Up. 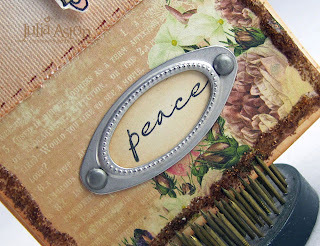 I stamped 'peace' on a piece of Vintage Cream cardstock, cut it with the small oval punch by Stampin'Up then sponged the edges with Tea Dye ink. It fit nicely inside the frame. So - there's just one more tag to go and I'll be done! I hope I haven't bored you to tears with all these tags...?!?! 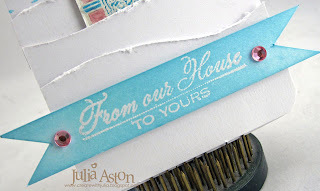 Accessories: Tag & Bookplate die - Tim Holtz Alterations, small oval punch - SU, Tea Dye Distress Stickles, Copics - R20, E00, Metal Frame and Big silver brad - SU, small brads - Imaginisce, wrinkled seam tape. 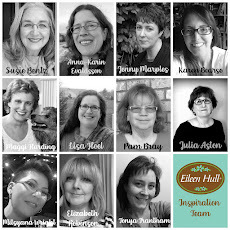 Well, we're coming to the home stretch with Ellen Hutson's 12 Tags of Christmas - today I have Day 8 and Day 9 to share with you! The background is stamped with a stamp from Pic-Nic Patterns by Waltzingmouse and the snowflake covering the hole at the top is from Sewing Box Christmas. 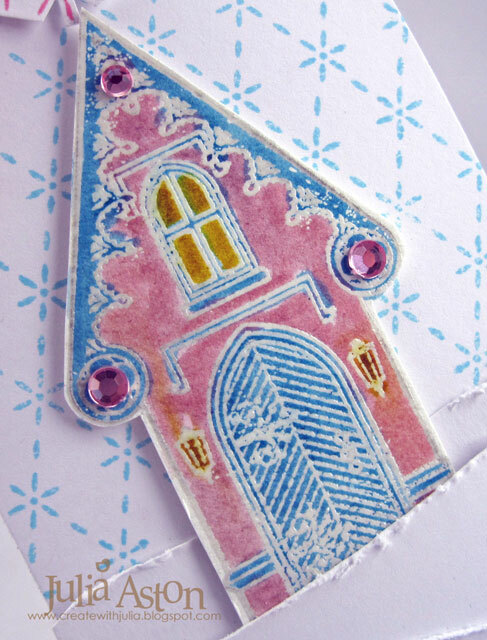 I clear embossed the cottage from A Cottage Home on watercolor paper and colored it with Tim Holtz Distress Markers. I clear embossed this sentiment from A Cottage Christmas on white and then sponged it with Ranger Distress Tumbled Glass Ink. 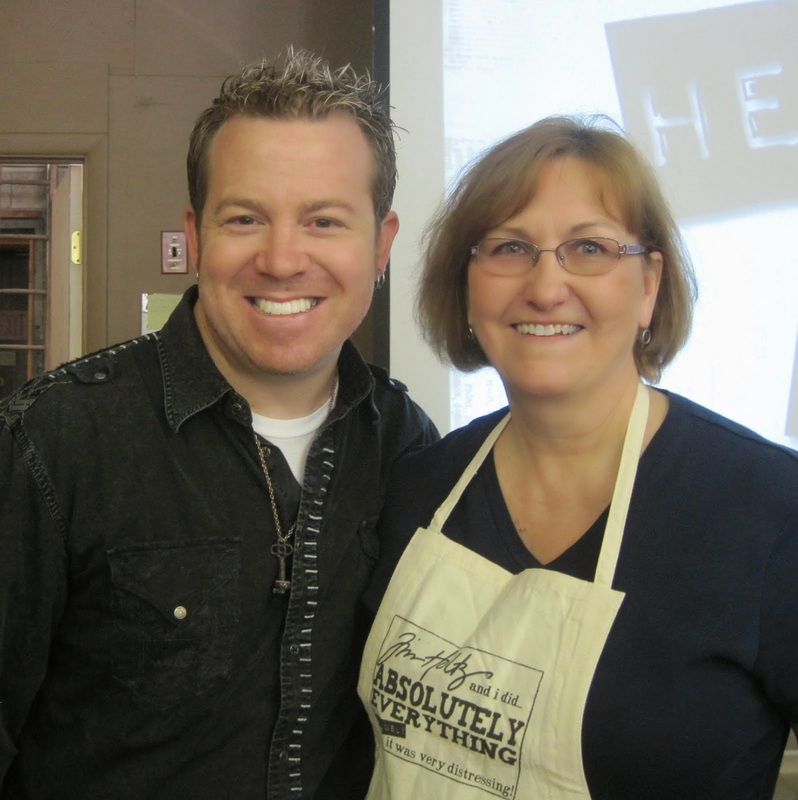 Day #9 Tag was designed by Paula Cheney (and gave me fits! she used a lot of glitter and I just could not get the right look with the glitter I had - so I used brushed silver paper and added Crystal Ice Stickles! I also sponged my background too much so there is not enough contrast between the wreath and the background...... Ugh!! 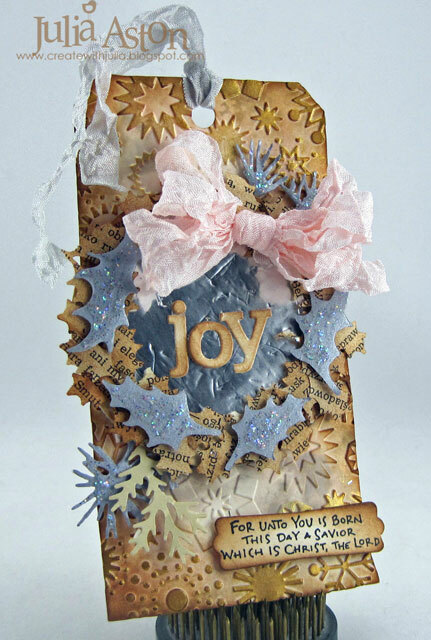 The tag is embossed with the Snowflake Embossing folder by Provo Craft, then inked with Frayed Burlap and Tattered Rose Ranger Distress Stains. 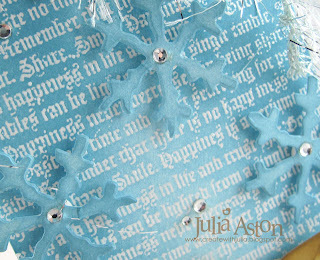 Paula used a Tim Holtz holly wreath die for her tag - which I do not have - so I die cut a circle out of Grunge Paper - layered it to a circle of text paper (from an old book). I die cut a circle out of a sheet of Ranger Foil Tape for the center of the wreath. Then I punched holly out of the text paper with my Martha Stewart punch (that I just got at Michaels for half price!). I attached each piece of holly around the outside edge of the circle with foam dots (ask me how long this took me!!!!) The sparkly silver holly and sprig pieces sticking out at the bottom left and top write are die cut from Festive Foliage Greenery Sizzlit. Some of the embossings on the tag were 'painted' with a mixture of Gold Perfect Pearls and water. My JOY letters are cut with Block Alphabet Dies from PTI. 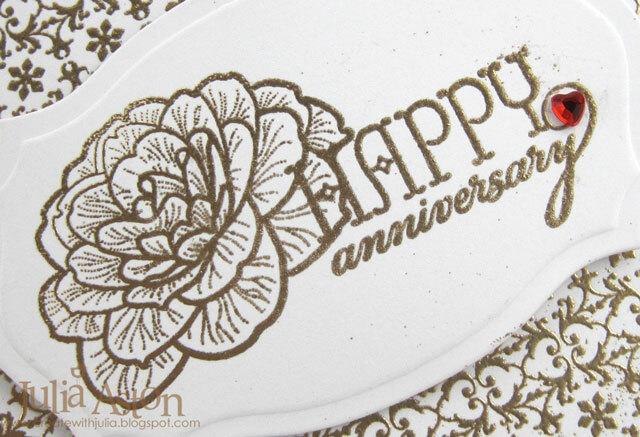 The sentiment is by Wordsworth and cut with the Modern Label punch by Stampin'Up. And I just realized I forgot to put on the pearl 'holly berries' ! My bow was made with wrinkled seam tape. Three more tags to go and then I can go wrap presents! Accessories: Ranger Distress Markers - Tumbled Glass, Spun Sugar and Mustard Seed, hot gun, white embossing powder, yellow/pink twine - Pink Paislee, distresser - Ranger, Zutter Corner Rounder, Circle punch. Ink: Versafine Onyx Black, Ranger Distress Vintage Photo. Accessories: Fanger Distress Stain - Frayed Burlap and Tattered Rose, Crystal Ice Stickles, Modern Label Punch - SU, Circle Nestabilities, Perfect Pearls - Perfect Gold, holly punch - Martha Stewart, Block Alphabet Dies - PTI, mini mister - Ranger, Festive Foliage Greenery Sizzlit - Ranger, Snow flakes embossing folder - Provo Craft, Tag and bookplate die - Tim Holtz. As promised - here are 3 more of my tags for the Ellen Hutson 12 Tags of Christmas. I'm finally caught up - well, not in my posting of them but in my making of them! They end on December 12th so I'll post my final tags in a day or so! I didn't add as much sparkle as Kittie - I had a little 'glitter crisis' when I tried to glitter the slopes (!) and had to tear them off and try again! - so I just used my crimper to give them dimension (great idea Kittie!) and put a little glitter on the tree! I used a different deer (Tim Holtz Alteration Mini Reindeer and 25 die) and tree (Dee's Distinctively - small snow covered tree die) and I added a little snow rabbit! (Papertrey Ink - In the Meadow)I love the stark white against the blue starry sky! I just didn't have it in me to make the pretty twine trees Teri created on her tag (winding all that twine around the tree shape!) 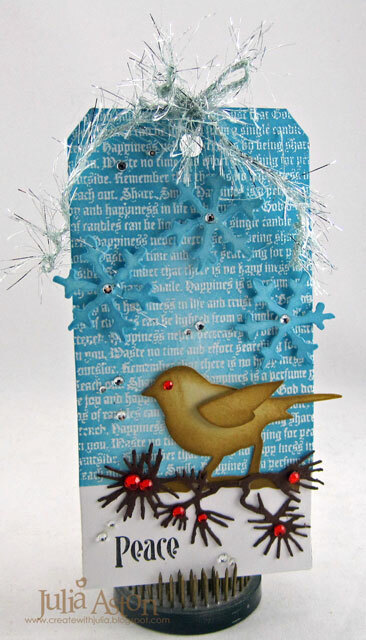 - so instead I used my favorite new tree die from Dee's Distinctively. I stamped some white cardstock with a woodgrain background stamp from the Woodgrain Backgrounder stamp set by Waltzingmouse. I did add lots of twine to the top to make up for the design change!! 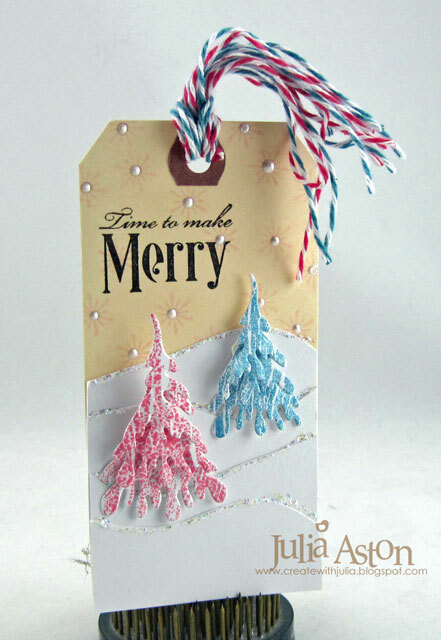 The pink stamped snow flake is from Compliments of the Season set and the Time to make Merry is from Ornate Ornaments - both by Waltzingmouse. I added White Opal Liquid Pearls to the centers of the snowflakes. I used some sparkly black Thicker letters that I had in my stash and I used the Tim Holtz rosette die as I didn't have the snowflake rosette. (There's always something MORE to buy isn't there!!) 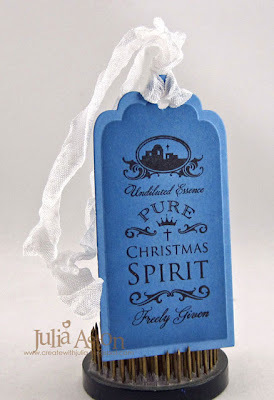 I dry embossed the tag with Snow Flakes embossing folder by Provo Craft and then I ran Tumbled Glass distress stain over the top. I embossed the whole tag with Moon Glow Embossing powder that gave it an iridescent glow IRL! 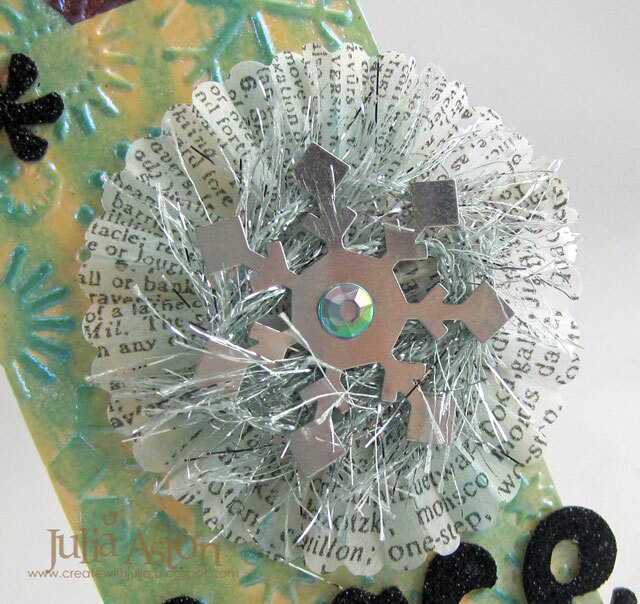 I cut the rosette out of Tim Holtz Tissue Wrap/Terminology, added a metal snowflake to the middle and wrapped Glitter Eyelet Yarn around the snowflake. Sunday I worked on my Days 8 and 9 - and I'll be posting them soon! Just 3 more to go after that! These tags are fun - but what pressure to get them done in a timely fashion!! (of course it's pressure I put on myself because I want to make them as soon as I see them!!) I really like learning new techniques - or seeing how I can recreate the effect with what I have. 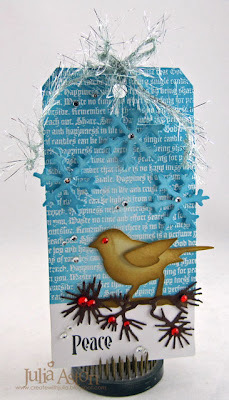 Accessories: wrinkled seam tape - Prairie Bird Boutique Etsy Shop, small snow covered tree die - Dee's Distinctively, foam tape, glitter, crimper, Mini Reindeer and 25 die - Tim Holtz Alterations, rabbit die - PTI Into the Meadow. Accessories: small snow covered tree die - Dee's Distinctively, Liquid Pearls White Opal, Crystal ice Stickles, foam tape,Pink Sorbet and Ocean Bakers Twine - The Twinery. Accessories: hot gun, moon glow embossing powder, tumbled Glass Distress Stain - Tim Holtz, glitter eyelet yarn - Martha Stewart, Black Thickers, Snow Flakes embossing folder - Provo Craft, Rosette Die - Tim Holtz Sizzlet, metal snowflake charm - from stash, rhinestone - Michaels, black ribbon - Amuse. I'm playing a little catch up here with Ellen Hutson's 12 Tags of Christmas - today I have Claudine Helmuth's Tag #2, Julie Ebersole's Tag #3, and Jennifer McGuire's Tag #4! First I painted my manila shipping tag with Hydrangea Pink Acrylic Paint by Delta. The cute little VW car with the presents stacked up on top is from Amuse - called Car Load. First I stamped it on white, then paper pieced it with dotted papers by PTI. My dots are made with White Enamel accents by Ranager - but I don't think I shook it enough because they dried clear rather than white!!??!! The music and Naughty or Nice pieces are paper ribbon that I purchased many years ago at a ribbon shop in Wolfeboro, NH. The red woodgrain is Washi tape from Freckled Fawn and the cute pom pom ribbon is by American Crafts. I had a bigger mitten than Julie's so I only used one - and I didn't have a glassine envelope that would fit the space left so I didn't use one! The mitten and sentiment are from the Sewing Box Christmas set by Waltzingmouse. 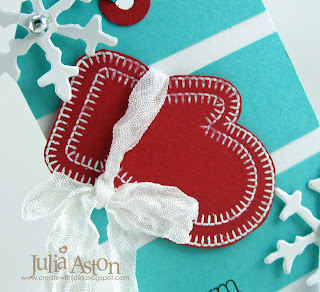 I embossed it in white on red card stock. The snow flake is from the Winter Wonderland die by Tim Holtz. I tied a piece of wrinkled seam tape around the mitten and let it hang down. For this tag I used my Tim Holtz Tag and Bookplate die (that I forgot I had!!) It's bigger than the Avery Shipping tags I've used on the rest of my tags so far - but of course that means more space to fill as well!! The Peace sentiment is from Ornate Ornaments by Waltzingmouse. I used a text background with a wonderful old world font from the Text It set by Waltzingmouse - embossing it in white and then sponging the tag with Ranger Distress Broken China. I didn't think I could color my bird nicely the way Jennifer did hers - so I just sponged the edges with Ranger Distress Brushed Corduroy and added a rhinestone eye. 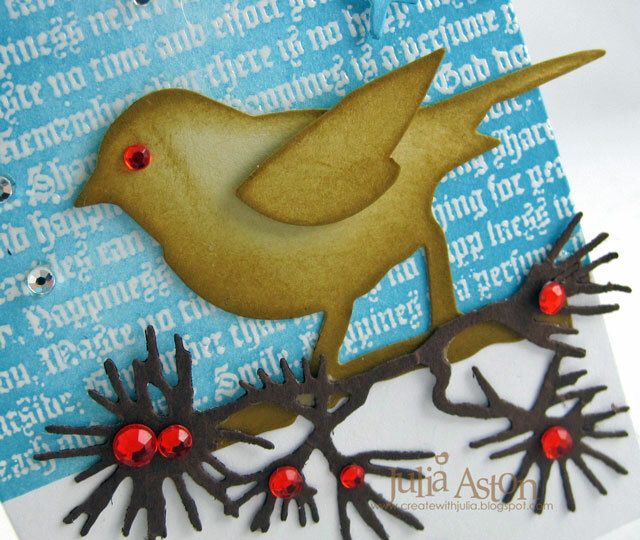 I layered a die cut pine bough from the Tim Holtz Festive Greenery Sizzlit die over the branch the bird is on. So......be sure to check out Ellen's fun tags for Christmas - there are prizes to be won if you link up your tags! I'll be posting tags #5, #6, and #7 shortly I hope you stop back! Accessories: White Enamel Accents - Ranger, Hydrangeo Pink Acrylic Paint - Delta, paper ribbon - ribbon shop in Wolfeboro, NH, washi tape - Freckled Fawn, black felt ribbon -Michaels, pink ribbon - Amuse, white pom-pom ribbon - American Crafts. Accessories: White embossing powder, hot gun, foam tape, silver pearls - Michaels, wrinkled seam tape - Prairie Bird Boutique Etsy Shop, blue ribbon -Amuse, snowflake die - Winter Wonderland/Tim Holtz Alterations. Accessories: foam tape, glitter eyelash yarn - Martha Stewart, tag from Tag and Bookmark die/Tim Holtz Alterations, red rhinestones - Kaiser craft, clear rhinestones - Michaels, bird - Caged Bird Die and Snow flake from Winter wonderland die - and pine branch from Festive Greenery Sizzlett die -Tim Holtz Alterations.